If something is anti-infection, you need to rotate the use of it. Say that it is 95% effective against a specific family, that means 5% of a bacteria family can resist it. When the 95% dies, the remaining 5% will slowly grow to take it place. Curcumin or whatever — will no longer be effective against that family because your eventual population will likely be 95% resistant. The bacteria quickly learns that the genes for resistance (although expensive to keep going) is preferred. There are several studies that found that pulsing antibiotics was more effective than continuous application. Bacteria are adaptive, not machines. E. coli ATCC 25922 .
showed significant antibacterial activity …against 65 clinical isolates of Helicobacter pylori . 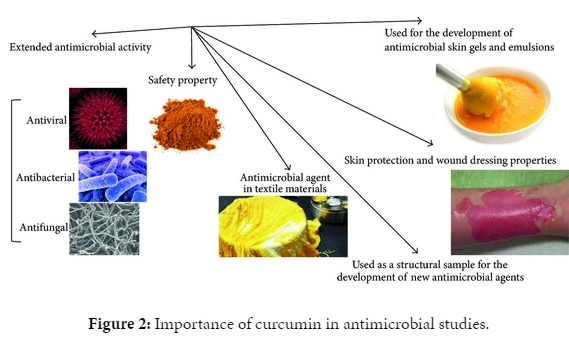 The methanol extract of turmeric demonstrated antifungal activity against Cryptococcus neoformans and Candida albicans with MIC values of 128 and 256 μg/mL, respectively . S. mutans and L. acidophilus were susceptible to curcumin in the presence of blue light. Reduction of good bacteria that was already low…. Thanks Ken. As far as rotations go, do you still recommend two weeks or so of each herb, then on to the next one? And do you think taking probiotics while taking these herbs makes sense? Taking herbs with probiotics means checking the interaction between the herb and the species in the probiotics. Some probiotic bacteria are resistant to some herbs, other are sensitive.